This past weekend Matt and I hung in the city Friday/Friday night and had one of the most amazing meals with some of our friends at 4 Charles Prime Rib in the West Village. The restaurant was small, cozy and perfectly inviting on a rainy night and we honestly had one of the BEST meals ever. We decided to all spilt a bunch of stuff (we always love doing this so we can try a lot of things), but hands down the burger (which they are known for) was out of this world! There are only about 12-15 tables inside, so our friend used the app Resy to place a “watch” on this restaurant and lucked up by snagging this reservation. If you live in NYC or are visiting, definitely give this place a try! Instead of hanging in the city the rest of the weekend, we decided to get up early and catch a train upstate to spend the rest of the weekend with Matt’s family. The weather was looking beautiful and there are so many fun things to see and do around where he is from. 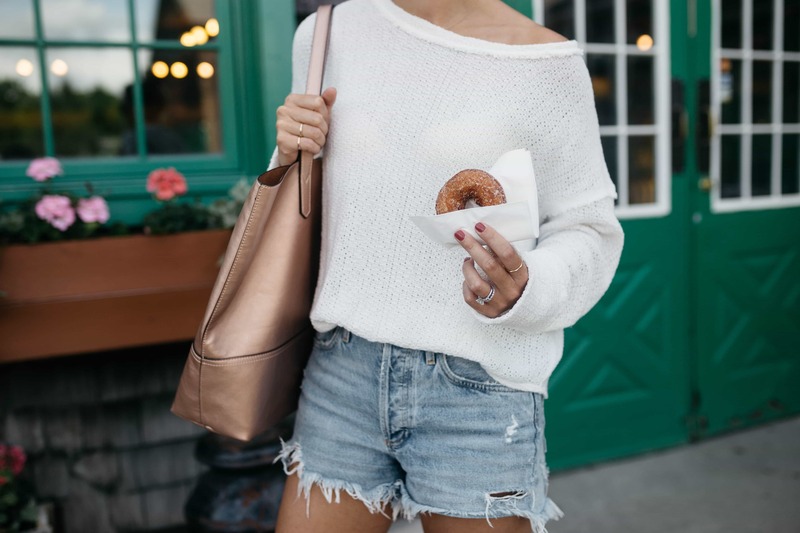 One of my favorite traditions is heading to a local farm and picking up fresh apple cider donuts and grabbing a cup of coffee. It rained the night before so the humidity finally broke and the weather cooled a bit making this lightweight sweater and shorts combo perfect. 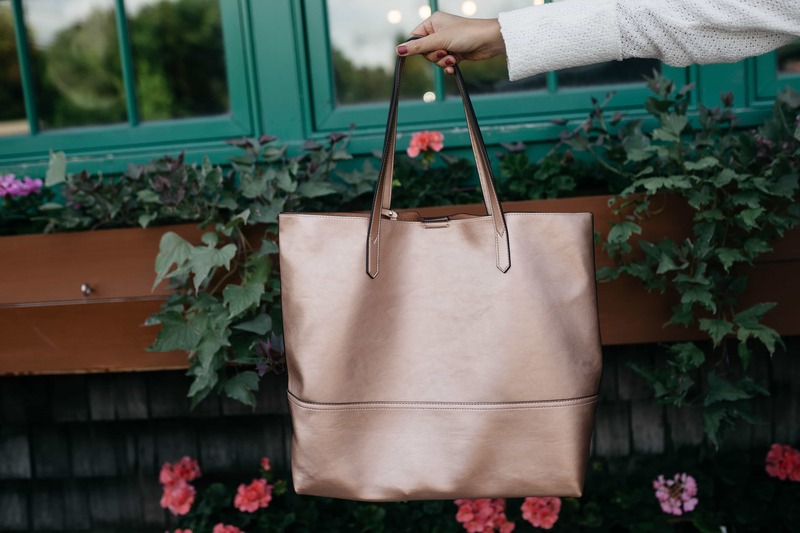 Also, I always carry a larger tote when traveling for the weekend so I can fit a bunch of stuff and this one from Sole Society is great. I love the rose gold, but it also comes in silver and has a small pouch inside for any tiny items you may have so they wont get lost. I always tend to keep things fairly casual for a weekend away like this one. One pair of shorts, a tee, a lightweight sweater and a pair of sandals that go with it all. Between carrying Hadley, my computer and camera and other odds and ends, I find it easiest to pack a few neutrals that all go together so I don’t have to worry about a bunch of outfits. I hope you all had a great weekend as well and lets get after this Monday!